Georgia was a 13 year old female Impala from the Brevard county zoo. She was noted by zookeepers to have a cloudy appearance in her right eye and was exhibiting a change in feeding behavior. She was found to have a senile cataract with an anterior lens luxation. The eye was quiet with no other gross disease present and was normotensive. She was considered to be old but was in apparently good health and following a normal physical exam and bloodwork the zoo opted to have a lensectomy (removal of the lens) performed. Cost of surgical supplies was covered by the zoo and the procedure and staff time was donated by the Dr. Matt Fife and the Veterinary Ophthalmology Center. Surgery was performed on site at the zoo under general anesthesia. 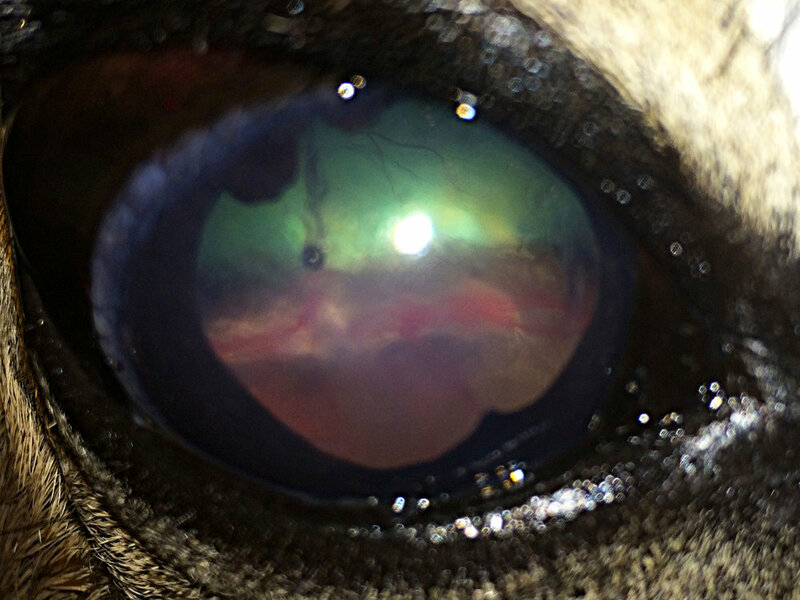 A routine intracapsular lens extraction (ICLE) was performed. Subconjunctival ofloxacin and betamethasone were administered at the time of surgery. Oral antibiotics and antiinflammatories were given for one week post op. No discomfort was noted during recovery and the patient showed no desire to rub at the eye. Due to the fractious nature of the animal, follow up was limited to observation from outside of the enclosure. Healing was routine and the eye appeared to be visual with improvement in her behavior. One year following surgery she continued to do well.